We create high quality 100% combed cotton, soft, smooth, interlocking fabric towels that make caring for your hair easier. Our friction-free, 100% combed cotton fabric treats your hair right. 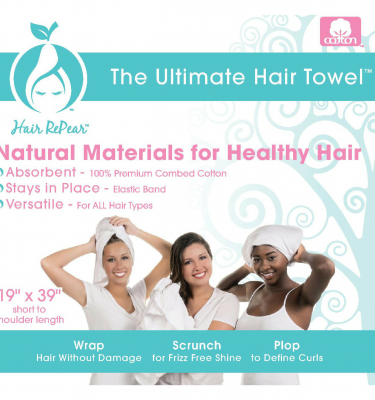 The Ultimate Hair Towel is not just a towel, it is a time saving and must-have beauty tool that gently absorbs water without causing damage or frizz and leaving your hair holding on to its natural shine and vitality. 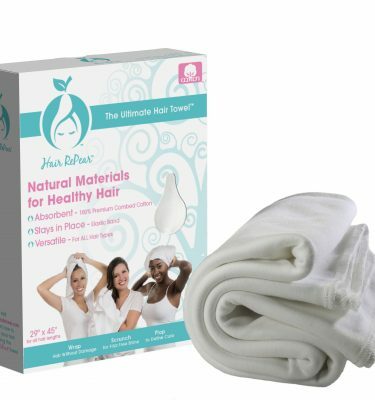 The Ultimate hair towel’s completely smooth surface is unlike Terry Cloth and Microfiber – which are the main fabrics used in traditional hair/bath towels. Loops, ridges, and bumps found on terry cloth and microfiber cause friction. Friction is Enemy #1 to your hair causing dreaded frizzy hair, breaks, and flyaways. An elastic band holds the Ultimate Hair towel securely in place, saving you time while you get ready by helping hold hair in perfect place! We know that managing frizzy hair, or all hair for that matter, can be a difficult task! That’s why we’ve made “how to’s” to make it easy for you to begin using our product, and to see a difference in your hair almost immediately.